As many as 15 million people in Florida lacked power this morning, an astonishing figure that represents three-quarters of the state's entire population. MIAMI — The remnants of once fearsome Hurricane Irma rolled through the Southeast on Tuesday, still carrying flood risks and leaving a staggering recovery effort in its wake that includes simply trying to turn the lights back on across huge swaths of Florida. The unprecedented outages – knocking out power to more than half of Florida’s homes and businesses – also unleashed a cascade effect across the region. Millions of people who fled Irma may struggle to return home for weeks as crews try to deal with downed lines, debris and a storm-swamped electrical grid. Electrical power is needed, too, to keep water and sanitation systems operating. For those with a generator, fuel supplies depend on the success of a logistical network trying to keep gas flowing to all points of battered and sweltering Florida. “Power pretty much drives everything,” Christopher Krebs, assistant secretary for Infrastructure Protection at the Department of Homeland Security, said at a news briefing Tuesday. Krebs said Tuesday morning that as many as 15 million people in Florida lacked power, an astonishing figure that represented three-quarters of the state’s entire population. This number will evolve, though, as crews are able to navigate debris and try to restore power. State emergency officials said that some 5.5 million power company customers lacked power on Tuesday morning, representing about nearly 53 percent of all customers statewide, a figure that had dropped since Monday. Since each account can represent more than one person, the overall figures remained at remarkable levels. Perhaps most alarming to those in Florida who awoke without air conditioning or working refrigerators is the reality that in some cases, power may not return for days or weeks. “This is going to take some time to restore, and in some circumstances, it will be a situation about rebuilding,” Krebs said. Krebs’s figure was higher than those offered Monday by utility companies supplying power to a large number of Floridians. Eric Silagy, president and chief executive of Florida Power and Light, the state’s largest utility and which powers half of the state, said Monday as many as 9 million people were affected by his company’s outages alone. Shawna Berger, a spokeswoman for Duke Energy, said 1.2 million of its 1.8 million customers were without power Monday in the state. Berger said if you multiply that number by 2.5 – per the latest census data, she said – it shows that 3 million people were affected at the peak blackouts. Florida was not alone. Blackouts hit wide areas in Georgia and South Carolina – with more blows possible as the remains of Irma continue moving north. Georgia power officials said Tuesday that about 800,000 people in the state lacked power. Some air service was scheduled to resume to Miami and other Florida airports, but hundreds of flights remained canceled in Atlanta, a key hub in the country’s air travel system. The National Hurricane Center said Irma, now classified as a post-tropical cyclone, was expected to weaken throughout the day Tuesday as it moves through the Southeastern United States en route to the Tennessee Valley. In a sign of how the storm had lost steam as it moved inland, the hurricane center said its advisory Tuesday morning was the final dispatch it would release on Irma. Still, Irma was not entirely done. The hurricane center said its rain bands would cause “localized intense rainfall” that could lead to flash flooding, even as the storm’s rainfall left behind flooding in Florida and potentially Georgia and Alabama. In Jacksonville, the city tucked along Florida’s northeast coast that sustained historic flooding as the St. Johns River swelled, the sheriff’s office said Tuesday that mandatory evacuation orders have been lifted. Rescuers had used boats, water scooters and even surfboards to get to residents surprised by the rising waters, said Kimberly Morgan, a spokeswoman for the Clay County emergency center. “You have to get creative in a situation like this,” she said. Remarkably, the storm could have been much worse. That was the grateful mantra on the lips of many who surveyed the damage in the mainland United States. Though there was significant property damage in the Florida Keys and in some parts of southwest Florida, officials said they were investigating just a small number of fatalities that came as the storm made landfall. It was unclear how many were directly related to the storm. Damage to water supplies in the Keys remained a top concern, however. A Defense Department statement said an estimated 10,000 people who rode out the hurricane in the Keys could still face evacuation. But there were no immediate plans underway to move people from the island chain. 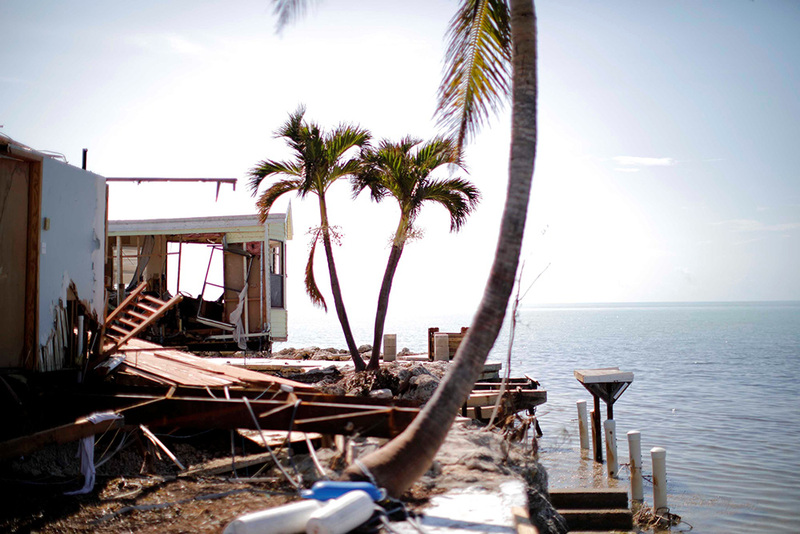 Authorities in Monroe County, which includes the Florida Keys, said they would begin allowing residents and business owners to return to some parts of the archipelago on Tuesday morning, including Key Largo, Tavernier and Islamorada. In a message posted online, Monroe County officials said people heading back to the Keys should remember that “most areas are still without power and water,” cellphone reception is questionable and most gas stations remain shut. Marilyn Miller awoke in St. Petersburg at 1:30 a.m. Monday to a pitch-black house. A native Floridian, Miller was expecting the outages and has even gotten used to them after enduring years of tropical storms. What she didn’t expect, she said, was the possibility that the blackout could last for days. As neighbor after neighbor on her block tried to call Duke Energy for help, they heard that just 80 homes in their neighborhood had lost power – out of more than 100,000 across Pinellas County. It became clear, Miller said, that her neighborhood would not be a priority. So she started making readjustments to a time before technology. Driving in many cities remained extremely hazardous – an exercise in vigilance due to downed trees and the ubiquitous palm fronds that lurked in wait like alligators on the street. In Miami, some residents expressed frustration about the evacuations, which in many cases ultimately weren’t necessary. 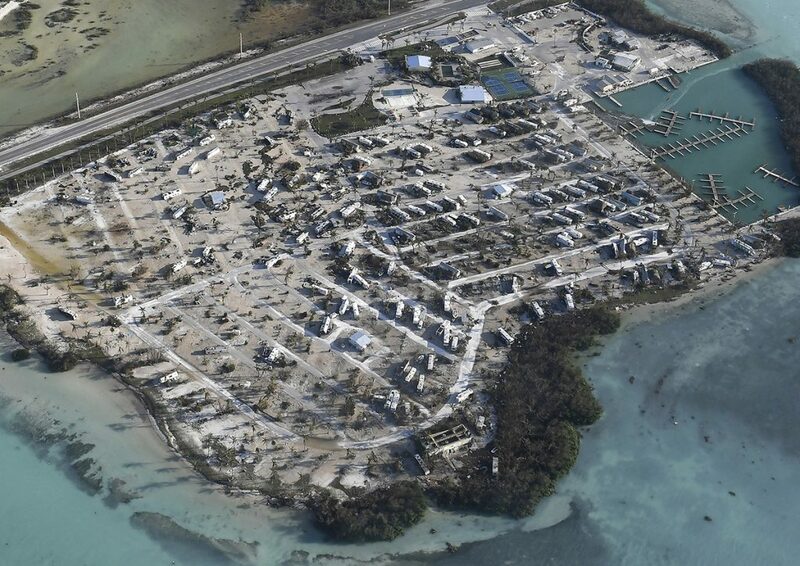 Overturned trailer homes are shown in the aftermath of Hurricane Irma in the Florida Keys. That was a familiar story: People who evacuated from Miami to Tampa. And then, in some cases, from Tampa to Orlando. The storm followed many of them the entire time. “Every day you saw the models changing,” Zumpano said. But all along Miami’s streets, signs also remained of the hurricane’s fury and the tragic possibilities that might have been. Sailboats on Miami’s Coconut Grove marina were flipped over. Million-dollar yachts were half submerged in the bay. Once idyllic parks looked like desolate war zones. Large trees toppled over, roots dangling in the air. Resident Paul Plante came to the marina to check on his home and boat, which he had docked indoors. His boat was fine, and he and his sister looked in disbelief at the submerged boats in the bay that weren’t so lucky. Berman reported from Washington. Brian Murphy, Katie Zezima, William Wan, Angela Fritz and Sandhya Somashekar in Washington, Darryl Fears in Orlando, Perry Stein in Miami, Patricia Sullivan in Estero, Fla., Lori Rozsa in Gainesville, Fla., Dustin Waters in Charleston, S.C., and Scott Unger in Key West, Fla., contributed to this report.